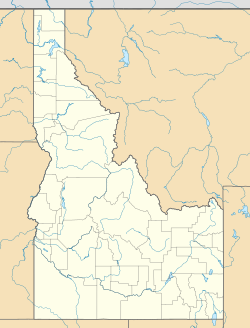 Riddle is an unincorporated community in the southwestern part of the U.S. state of Idaho, in Owyhee County. Located on SH-51, it is 13 miles (21 km) north of the border with Nevada and 79 miles (127 km) south of Mountain Home. The community lies at the north edge of the Duck Valley Indian Reservation. The community has the name of the local Riddle family. In 2000, the average median household income for the ZIP Code Tabulation Area that includes Grasmere and Riddle was $30,921. Riddle's elevation is 5,367 feet (1,636 m) above sea level. Riddle was the fictional location for the beginning and end of the film Vanishing Point (1997 remake). ^ Moyer, Armond; Moyer, Winifred (1958). The origins of unusual place-names. Keystone Pub. Associates. p. 112. ^ "Fact sheet: Zip Code Tabulation Area 83604". 2000 Census. United States Census Bureau. 2000. Retrieved 2007-04-21. ^ "Geographic Names Information System". U.S. Geological Survey. U.S. Department of the Interior. 1979. Retrieved 2007-04-21. This page was last edited on 15 January 2018, at 05:11 (UTC).